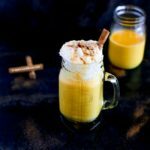 Homemade pumpkin spice latte recipe (without coffee)! And, bonus! Learn how to make Korean style pumpkin latte (no coffee, again) along the way! They both are perfect comfort drinks on a cold wintery day. Delicious, of course! On the weekend, I bought some pumpkin to make my baby girl’s solid food. It was only 1/2 a cut pumpkin but it was still big. There was no way she would finish it by herself this week. So I thought of making some pumpkin latte for us. Great idea, don’t you think? Just the echoing the sound of ‘pumpkin’ sounds so relaxing to me. Typical Korean style pumpkin latte (aka Danhobak Latte, 단호박 라떼) is very simple. 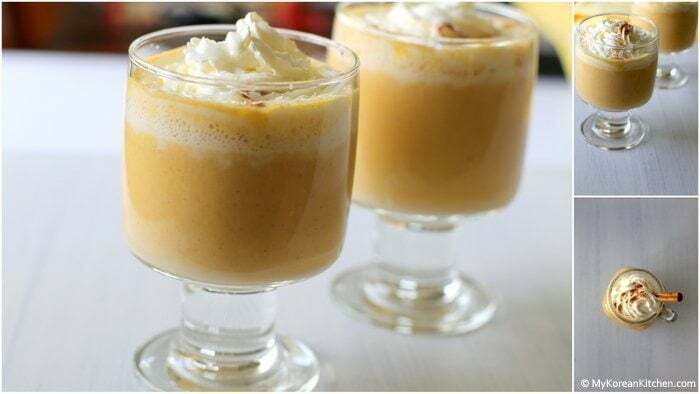 It only requires three ingredients: milk, pumpkin and sweetener (sugar or honey). No coffee! And, maybe add some pumpkin seeds as a decoration like the below picture. To get some ideas, I did a google search and the first one that appeared was Pumpkin Spice Latte by Betty Crocker. It gave me some rough ideas on how to spice my pumpkin latte. Also, during my research, I found that Pumpkin Spice Latte by Starbucks is really popular. Have you had this before? I’ve never been to Starbucks, lol, so I can’t tell how closely my latte would taste to theirs. I would love to find out soon! Anyway, I tried to aim at preserving the natural sweet pumpkin flavour by using real kabocha squash. Also, as I don’t drink coffee normally, I didn’t add any espresso. 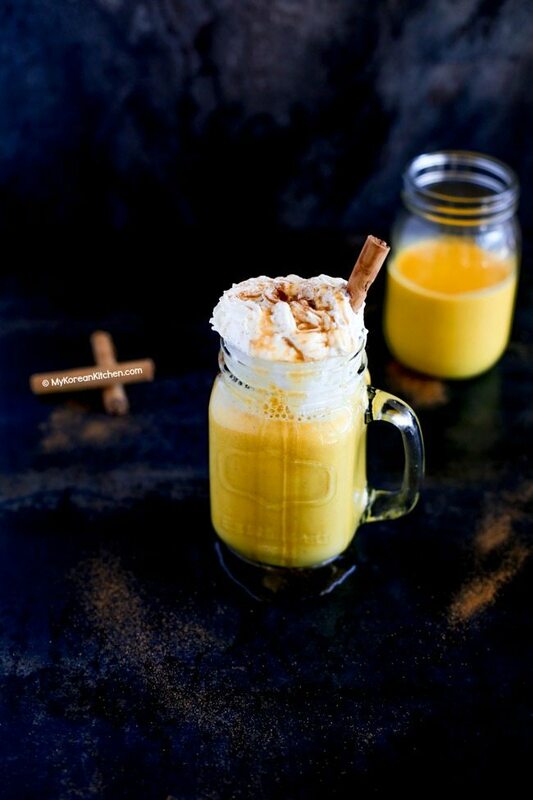 If you want to follow Korean style pumpkin latte, just follow the below recipe up to sugar. However, it you want to venture out a bit more, you could try the whole of my recipe and let me know what you think of it. P.S. 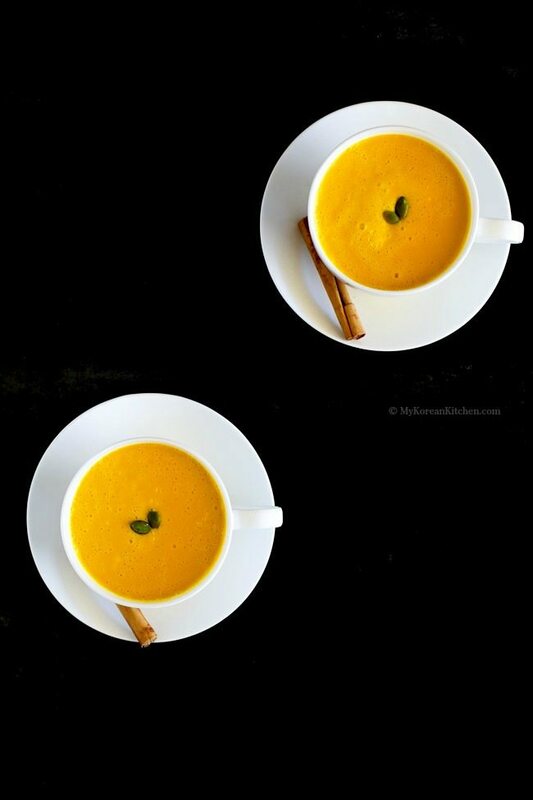 If you like this recipe, you might also like to try Korean sweet potato latte (no coffee) too! 1.Prepare pumpkin for steaming. Wash and cut the pumpkin into small chunk pieces. Peel the skin off the pumpkin. Steam it in a boiling pot until it is cooked (20 to 25 mins). 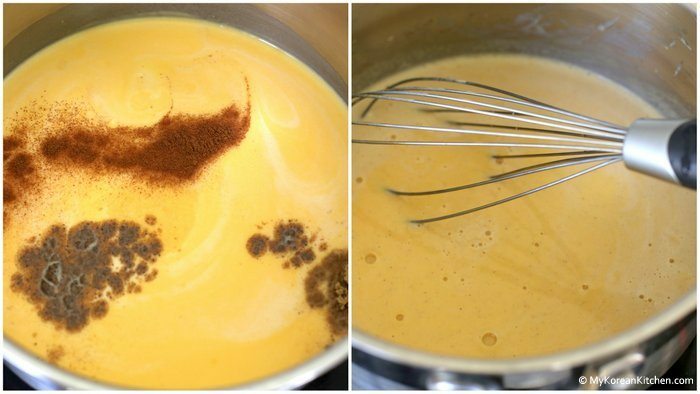 2.Once the pumpkin is ready, put the steamed pumpkin and the milk into a blender. 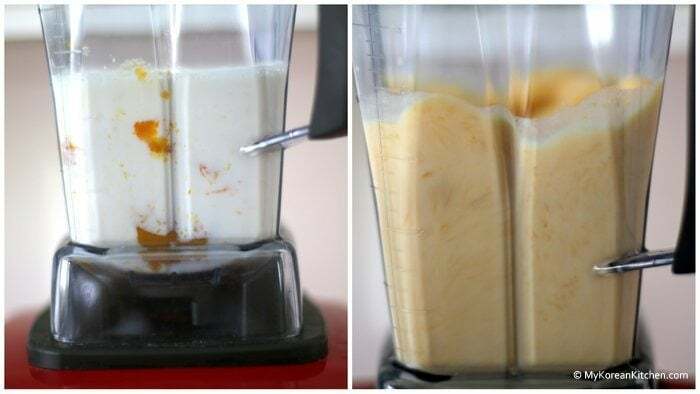 Blend it (approx 1 minute – to a complete liquid, not pulpy). 3.Pour the blended mixture into a pot then add the rest of the ingredients (excl. optional). Heat it up on low temperature setting for 4-5 mins. Stir/Whisk constantly. 4.Pour the pumpkin latte into a mug/tea cup. Decorate with optional ingredients then serve. 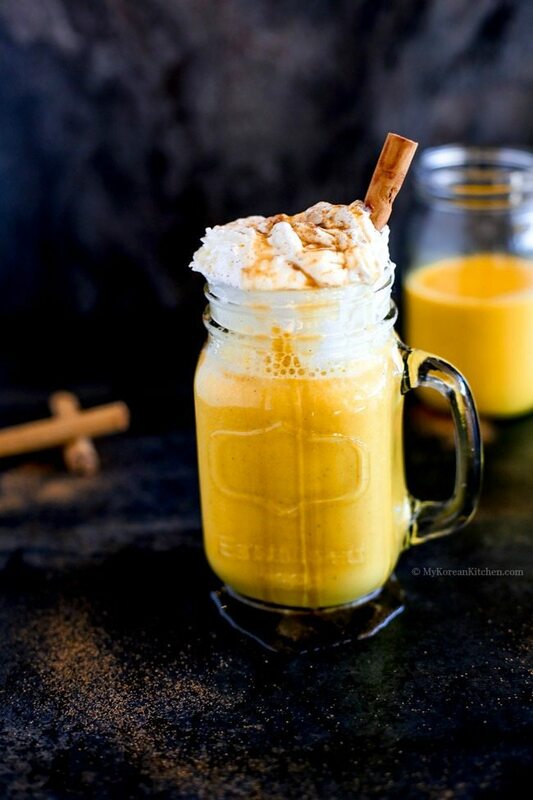 Ultra delicious and super comforting no coffee pumpkin spice latte! Made with real kabocha squash! Prepare pumpkin for steaming. Wash and cut the pumpkin into small chunk pieces. Peel the skin off the pumpkin. Steam it in a boiling pot until it is cooked (20 to 25 mins). Once the pumpkin is ready, put the steamed pumpkin and the milk into a blender. Blend it (approx 1 minute – to a complete liquid, not pulpy). Pour the blended mixture into a pot then add the rest of the ingredients (excl. optional). Heat it up on low temperature setting for 4-5 mins. Stir/Whisk constantly. Pour the pumpkin latte in a mug/tea cup. Decorate with optional ingredients then serve. Hi Sue, I am not Korean, but my husband is. I am so excited to find this recipe! I am going to try to make it with my left over 호박죽 from Thanksgiving. Thank you. Oh Yum! Sue, this looks awesome! I absolutely adore 단호박 so I def have to give this a try ;). I’m so glad I stumbled upon your blog! 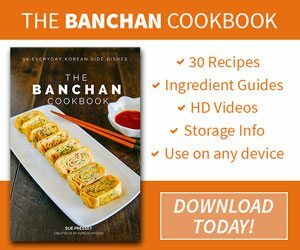 I just read your “about” page, and I’m so excited to check out your traditional Korean as well as fusion recipes. 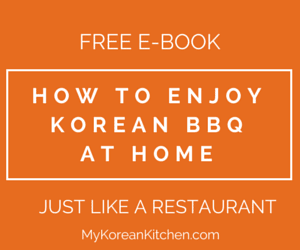 I’m Korean, but my husband and I rarely eat Korean food at home. We save that for when we visit our parents hehe. However, I’m dying to try your recipes. Like you and your husband, we, too, are having a lot of fun blogging as well. It def brings us closer together. I look forward to following your blog, Sue! Hope you have a blessed week. 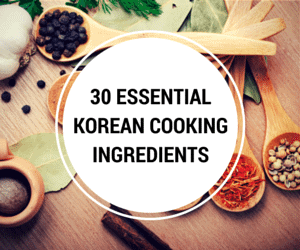 I don’t have the luxury of not cooking Korean food as my family lives far far away from us. 🙂 But lucky you! My mum’s food always tastes better than mine so I do miss her food. Thanks for stopping by. I used to get the pumpkin spiced latte often at Starbucks during its season. But not so much anymore. Homemade is so much better! Yours looks beautiful. I love it both cold and hot. I tried that instant one in the pack that my mom bought, but it tastes so instanty! Although I can drink instant coffee all the time, I cant drink the pumpkin drink instant. Homemade from scratch is best. Have to try this weekend.. Never seen a latte with pumpkin before.. Must try. So happy to hear that! Yes, it tastes really healthy. I going to make some more this weekend too! This looks really delicious! Does it matter if you use kabocha squash (dan hobak) or other kinds of pumpkin? Thanks Rosa, My pumkin was kabocha squash. (Though it was labelled as kent pumpkin but that’s how it is called in Australia). I think other types of pumkin can be used as long as they have sweet and nutty flavor. 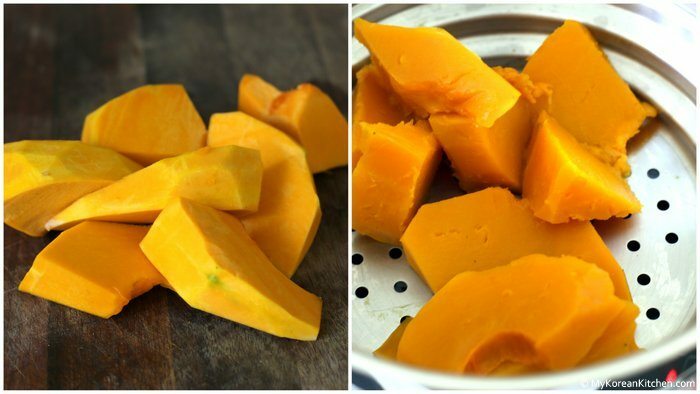 I know butternut squash is a popular alternative to kabocha squash in many recipes. Hope this helps! Wow! You already tried this recipe hey? I’m so glad to hear you liked it. I prefer drinking it when it’s just warm but not too hot. 🙂 But for sure, it can be drank either hot or cold. Yes, pumpkin spice latte is extremely popular, and yours look absolutely amazing, Sue! I just want to reach it and have some right now hehe…thanks for sharing and enjoy your day! Thanks Sandra for such kind words. 🙂 Next time when I go to Starbucks, I will try it for sure!